Make a strong visual statement with round die cuts. These circular cards measure 8” in diameter and lend themselves to all sorts of eye-catching designs. Circle die cut cards are printed on 14pt ultra-thick card stock. You can print your design in color on both sides of the brilliant white stock, and then choose between a high-gloss UV coating and matte finish. An enticing or interesting design will make these die cuts stand out from the bulk of mailers and promotional pieces. 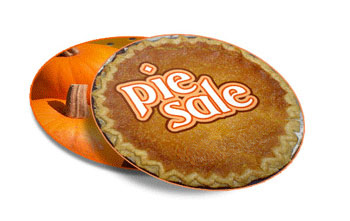 Use a message on the front to create intrigue, such as “Why are our pies considered the best in the area?” Then continue with an informative and persuasive message on the back, making the case for why customers should visit your place of business for pie. Don’t forget to list your location! For a more aggressive approach, put a strong pitch right on the front of your card, like “Come in for the best discount you’ll see all year!” On the reverse side, you can give details such as your business address and phone number, hours, and how long your sale will last. You can print in color on front and back, so your message will be delivered with maximum impact on either side. Circular die cuts are not just for advertising consumer goods like pies - they’re also great for showing financial information such as pie charts. If you’re in financial services, tax preparation, real estate, or a similar field, you can make a big impact by advertising your services with a visual representation. Show how much you saved your clients in taxes last year, or how investments you made for your clients increased in value over time. Get creative, and customers will respond.